High octane fun and action! Please note that priority will be given to deaf children over hearing siblings. Hearing siblings will be put onto a waiting list and their place will be confirmed when the bookings close. Please email Sindy at sindykc@hotmail.com to add a sibling to the list – don’t book their place just yet. One of the best days out in Surrey, Campaign is situated in a fantastic 100 acre forest near Cobham. Laser tag is similar to paintballing except it uses infra-red technology to register hits on the enemy rather than an actual projectile. The equipment is light, high tec and has an effective range of over 200 metres! 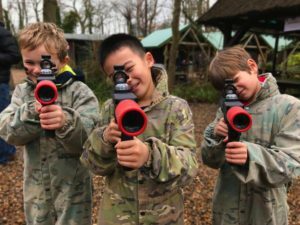 The children will be kitted up in all the latest gear, be briefed for safety and tactics, and then the SDCS Laser tag team will be let loose in one of 10 film-set designed game zones. There is a real-life cowboy town, trucks, jeeps, trenches, mine fields, a 30ft Zombie Tower and much more… a high octane fun session, not to be missed! Tickets are limited so please book early to secure your child’s place and avoid disappointment. Booking will close on Friday 28th September 2018. On the day, please arrive promptly at 11 am so that your child can be checked in, issued their kit, get dressed and have the introduction, safety and equipment briefing before the action begins. Located in stunning Surrey woodland, south west of London, Campaign Paintball & Laser Park is very easy to get to by road or rail. SAT NAV USERS PLEASE NOTE: Campaign is located in a forest and doesn’t have a specific postcode. Please don’t rely 100% on the postcode alone. If you are coming from the A3, Sat Nav will bring you about 1/2 mile before Campaign, so just keep going for another half a mile and Campaign is on the right hand side. Tea, coffee and water is provided but please bring any other refreshments you/your child would like to drink/eat with you. Please e-mail Sindy Midgley (sindykc@hotmail.com) with any other queries. Children at our events are the responsibility of their parents/carers. Please stay onsite at all times.